Equipment for Schofield Barracks' 3rd Brigade Combat Team sat yesterday before being loaded onto the cargo ship USNS Pililaau, named after Hawaii Medal of Honor recipient Army Pfc. Herbert K. Pililaau, killed in the Korean War. Some of the family members have been invited to visit the ship. Three months ago, leaders of the 25th Infantry Division's 3rd Brigade Combat Team sought Mayor Mufi Hannemann's advice in managing a large municipality. Lt. Col. J.B. Vowell, the brigade's deputy commander, said his boss, Col. Walter Piatt, sought Hannemann's counsel because one of his duties as head of the 3,600-member Army unit will be to help local Iraqi mayors rebuild their towns and cities. "We have a vested interest in helping them stand by themselves," said Vowell, who will be making his second deployment to Iraq in October. He believes the conditions there are much better than when the 3rd Brigade was in Kirkuk in 2006. This will be the 3rd Brigade's third wartime deployment since it was sent to Afghanistan in August 2004. "We sought the mayor's advice," said Vowell as he stood on the A-deck of the Navy's 949-foot cargo ship USNS Pililaau, which was scheduled to leave Pearl Harbor today with nearly 1,500 trucks, Humvees, containers and other equipment belonging to the brigade. "We as a brigade had to learn how to run a large municipality," said Vowell, who was brigade's operations officer during the unit's first deployment to Iraq, which ended last October. That means the brigade will be advising Iraqi municipal leaders on things like electrical power and water distribution, sewer systems, health, sanitation and similar issues, he said. The Schofield Barracks soldiers also will be involved in training soldiers of the Iraqi security forces. The Pililaau, named after Korean War Medal of Honor recipient and former Waianae resident Pfc. Herbert Pililaau, will offload the equipment next week at the beaches of Camp Pendleton near San Diego, where it will be convoyed to the National Training Center at Fort Irwin in the Mojave Desert. There the 3,600 soldiers of the 3rd Brigade will be joined with another 1,000 Schofield Barracks soldiers who will help the brigade prepare for its 12-month Iraq deployment. After the training at Fort Irwin, near Death Valley, is completed at the end of August, the soldiers of the 3rd Brigade will go on leave for nearly 2 1/2 weeks. "About a third of them will be released from the National Training Center," Vowell said, "while the rest will come back here to take their block leave." 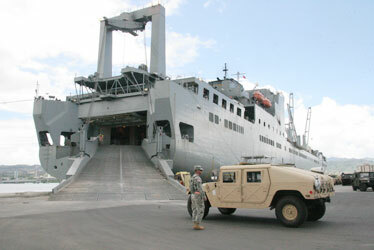 The Pililaau is expected to return to the islands on Sept. 16 loaded with 3rd Brigade's trucks, Humvees and other equipment. Vowell said some of the equipment will be offloaded at Pearl Harbor, but most will remain on board and be joined with other materials that will be needed for the 12-month deployment. Vowell said he expects the brigade to be located in the area north of Baghdad and possibly assigned to the Multi-National Division-North, which will be commanded by Maj. Gen. Robert Caslen, who also is head of the 25th Infantry Division. He and 1,000 other soldiers from his headquarters staff will also be deploying in October and will be stationed in Tikrit. The 3rd Brigade returned in October from a 15-month deployment in Iraq and will spend barely 12 months at home before heading out again. The unit arrived in Iraq in August 2006 in what was supposed to be a 12-month tour, but as part of the Pentagon's "surge" strategy, their tour was extended by several months. Thirty-six soldiers serving with the 3rd Brigade and other Schofield Barracks units died during the nearly 15-month deployment. During the brigade's first wartime deployment since the Vietnam War, 15 of its soldiers died in a deployment that ran from January 2004 through June 2005.